Love this stuff. Fast acting and it works. Thanks for a great night's sleep over and over. After suffering with restless legs and muscle cramps in pregnancy, I was recommended this product and it has been amazing! I can’t believe the difference - and the energy I feel from it is a nice bonus! Started using the product after starting selling it in my shop and its brilliant, does what it says on the tin, much better then tablets or capsules, would recommend and will keep using. 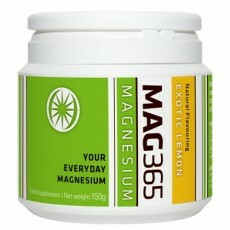 I’ve tried MAG365 and I can honestly say that I felt it worked for me from first use! I have a tendency to wake in the middle of the night, and while I still woke up that little bit too early, I felt far more refreshed the morning after taking MAG365. I felt like I had gotten a full night’s sleep! I didn’t feel at all groggy and I was able to focus so much better during the day as well. I love the Exotic Lemon flavour, especially when I make it into a nice warm drink before bed. I add just a teaspoon into a little bit of hot water (too much water and it will fizz up out of the mug! ), stir until it dissolves (in no time at all! ), and then fill the rest of the mug with warm water. I especially like that there are no nasty binders or fillers, and, as an added bonus, it’s vegan! I’m almost out, so I can’t wait to get some more!! ?